I enjoyed this review which I think covers the book, which I have just read, very well. The boxing scene I found rather interesting. There seems to be a fair amount of prejudice looking back on this writing-not at all funny by today’s standards. A minor character, Susan’s father is well drawn and prefigures in an amusing way, figures in “A Dance to the Music of Time”. 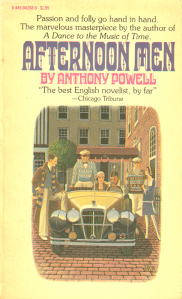 Afternoon Men was Anthony Powell’s first novel and was published in 1931 when Powell was only 26 years old. I found this copy in a secondhand bookshop when I was reading his twelve-volume series of novels, A Dance to the Music of Time. It’s a fun book and will certainly be of interest to anyone that has read Dance as the style and structure of the book is so similar to his later work. The book has little plot and instead concentrates on characters and the dialogue between the many characters, who are all from the same jaded semi-aristocratic, intellectual milieu as in Dance.